This report presents a preliminary emergency assessment of the debris-flow hazards from drainage basins burned by the Fourmile Creek fire in Boulder County, Colorado, in 2010. Empirical models derived from statistical evaluation of data collected from recently burned basins throughout the intermountain western United States were used to estimate the probability of debris-flow occurrence and volumes of debris flows for selected drainage basins. Data for the models include burn severity, rainfall total and intensity for a 2-year-recurrence, 1-hour-duration rainstorm, and topographic and soil property characteristics. Several of the selected drainage basins in Fourmile Creek and Gold Run were identified as having probabilities of debris-flow occurrence greater than 60 percent and many more had probabilities greater than 45 percent, in response to the 2-year-recurrence, 1-hour-duration rainfall. None of the Fourmile Canyon Creek drainage basins selected had probabilities greater than 45 percent. Throughout the Gold Run area and the Fourmile Creek area upstream from Gold Run, the higher probabilities tend to be in the basins with southerly aspects (southeast, south, and southwest slopes). Many basins along the perimeter of the fire area were identified as having low probability of occurrence of debris flow. Volume of debris flows predicted from drainage basins with probabilities of occurrence greater than 60 percent ranged from 1,200 to 9,400 m3. The predicted moderately high probabilities and some of the larger volumes responses predicted for the modeled storm indicate a potential for substantial debris-flow effects to buildings, roads, bridges, culverts, and reservoirs located both within these drainages and immediately downstream from the burned area. However, even small debris flows that affect structures at the basin outlets could cause considerable damage. 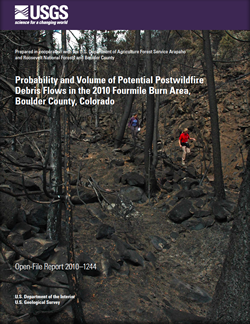 Ruddy, B.C., Stevens, M.R., Verdin, K.L., and Elliott, J.G., 2010, Probability and volume of potential postwildfire debris flows in the 2010 Fourmile burn area, Boulder County, Colorado: U.S. Geological Survey Open-File Report 2010–1244, 5 p.